Hello, friends, from the Pacific Northwest. Since we last spoke, I've relocated from California to Washington. I'm now a transplant to Seattle and it's been quite a busy two weeks. I'll start from the beginning. There's quite a bit to unpack so be prepared. I took a flight on the last day of March from Los Angeles to Seattle. I'd shipped about eight boxes with my job. Other than that, I moved with the rest of my whole life in an 80 lb suitcase. My new apartment wasn't ready for five days so I lived in an AirBnB and with friends. The first few days were okay. I was situated in the Capitol Hill neighborhood and got to explore a lot of the interesting businesses there (loads of coffee shops!). Come day three, I had been hit with either a stomach virus or food poisoning which meant for a not so great several days as I recovered. All the while, I'd had about two days after moving before I started at my new job! Hooeey! Things started to settle down a bit once I moved into my new apartment and started to set up my new life. The not so great thing about starting anew? All the money one bleeds! I'm largely set up now though I'm still sleeping on an air mattress until the real thing arrives. However, I am living alone for the first time in my life. Aside from now having to deal with my anxiety alone, it's been pretty nice. I can make my apartment exactly to my liking and I'm currently pursuing a wood/rustic/marine theme. My partner has my guitars at the moment, though, and I'm deeply missing them until they arrive because the acoustics here are amazing. What's the point of living alone if you can't have solo concerts? One of the hardest parts of the move was leaving everyone behind. My partner and I are now long distance. Though he'd left Los Angeles a month before I moved to Seattle, I felt his absence that much more once I moved out of our room. It was also difficult to leave family and friends, but on the bright side, I am thankful to have made such meaningful connections. I've started to write snail mail to the people I love. New life -- may as well, right? Now, you know I don't like to dwell too heavily on the negatives here so I want to talk about the great things Seattle has to offer! The air here is far better than Los Angeles. My allergies are gone and I can't remember the last time I breathed this well. All my life I've dreamt of living by the water and now I do. I live in a quiet neighborhood which has a lovely local coffee shop and THREE Italian restaurants. Dangerous for a pasta addict like myself! My new place also has a lovely little open shelving area that opens into the kitchen which might be my favorite part of the apartment. I'm currently filling it with knick knacks. Seattle also brings new faces and I'm so happy to tell you that I finally got to meet Olivia! We've talked about meeting for ages and now we live in the same city! 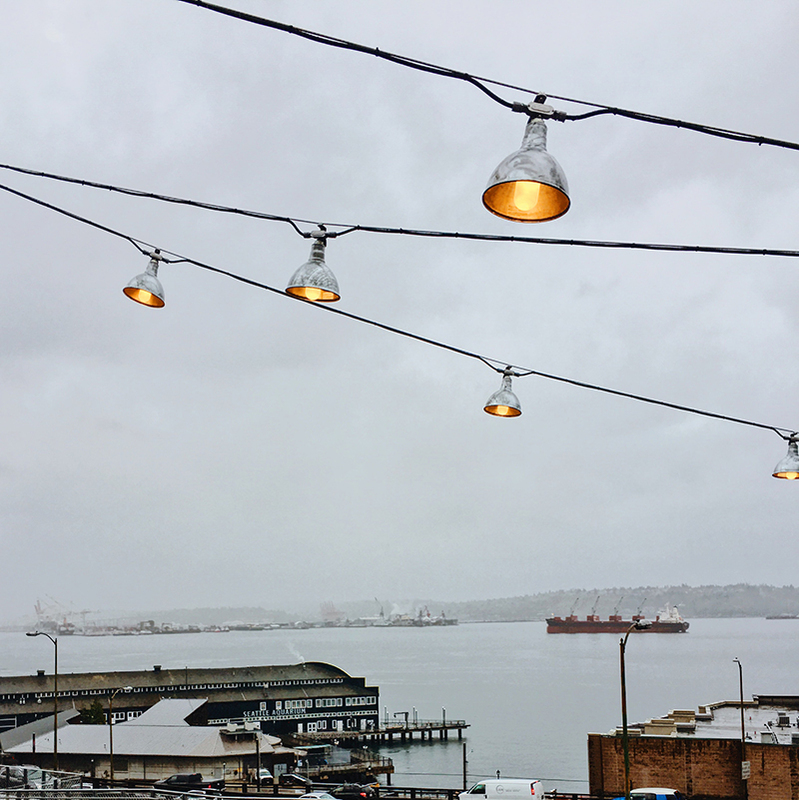 This Saturday, we met at Pike Place Market and had a great time hanging out. She's one of the warmest souls I've met and made me feel incredibly welcome. We meant to take photographs, but it was raining so hard that day that we went around buying from small, local businesses at the market. There are other adjustments to make as well such as the new job, new responsibilities, and . . . the weather. It rains ALL THE TIME in Seattle which is really nice for someone who misses the four seasons. When it's not raining, it's often overcast, which actually makes for great light for photoshoots. I did my first shoot out here with Seattle-based model Io today (we'd been following each other on Instagram and I ran into here one day in the city) which I'm excited to share soon. Yes, I know, I have a backlog of shoots. I'm hoping to do more shoots here on weekends! I'm currently sitting on the floor of my apartment since I don't yet have a couch. I'm gonna prepare for bed soon to get a start on the new week. Talk soon! Tell me what you did this weekend in the comments? Congrats on your move and new apartment. And new job!!! Yey!!!! Take your time decorating your new space. It's going to look awesome either way! Can't wait to read and look at your photos from Seattle. Congratulations on your move and new job again, Alyse! I'm so jealous you get to live in the Pacific Northwest now - where the views are greener and the air is cleaner. I love that little shelving system your new kitchen has. Can't wait to see it fill up! Also, I'm getting something in the mail soon right? :P Yay for meeting new friends! Glad you're fitting in just fine over there. Sending you love and some California sunshine! Congratulations on the move! Sounds like it's going smoothly, I'm glad. I found it a little bit hard to live on my own at first but filling the apartment up and making it feel homey really helped. Good luck!! © 2019 Lumière & Lens.